NEW YORK, New York, July 2, 2010 (ENS) – An environmental justice case in the South Bronx was settled Wednesday when New York City agreed to resolve long-standing community concerns about odors and emissions from sewage facilities in the Hunts Point neighborhood. 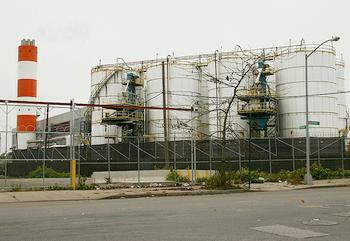 The settlement was reached between the New York City Department of Environmental Protection and Mothers on the Move, a South Bronx community group; the Natural Resources Defense Council; and and 10 South Bronx residents who complained for years of health and quality of life problems associated with sewage odors and fumes in their neighborhood. Under the settlement agreement, the city will stop shipment of sewage sludge to the New York Organic Fertilizer Company, NYOFCo, for at least two years and for the first time will require that any new sewage sludge processing facilities use best available odor control technology. Until this week NYOFCo was processing about half of the sewage sludge produced by the city’s 14 sewage treatment plants. The facility took in digested sewage treatment plant sludge, dried it and pelletized it to produce a commercial fertilizer. “This agreement ensures that the NYOFCo facility, which has plagued this community with its noxious odors for almost two decades, will not run as it is ever again,” said NRDC attorney Al Huang. The legal settlement coincides with the last shipment of de-watered sewage sludge to NYOFCo – one of the two sewage facilities at issue in the lawsuit. “The closure of NYOFCo is the realization of years of organizing and activism in Hunts Point and a much needed breath of fresh air for a community that has been stuck indoors for far too long due to the stench of local sewage plants,” said Wanda Salaman, executive director of Mothers on the Move. Most of the group’s 125 members are low-income women committed to a greener, safer South Bronx for their children. The other facility at issue in this case is the Hunts Point wastewater treatment plant, which treats sewage waste from over 600,000 Bronx residents. Under the settlement, the city agreed to conduct an independent evaluation to establish if any odors are emanating from the Hunts Point plant. The city will spend $87,000 to hire an independent consultant to perform an odor study of the sewage treatment plant and recommend strategies for implementing additional cost-effective odor control measures at the plant. Finally, the city agreed to clean up an acre of waterfront green space for future community use. The city will allocate $500,000 in matching funds for the remediation of a city-owned 1.2 acre parcel that will ultimately be incorporated into Barretto Point Park.